If you were a fan of The Daily Show with Jon Stewart, you're probably still adjusting to the new guy. And really, maybe it'll never quite be the same, differing comedic sensibilities being what they are. Early on in the show's new iteration, the jokes have been a little less political and a little more generic. Keep in mind, though, that all good things take time. Regardless, you might be wondering what the old host is up to now, with all that extra time on his hands. 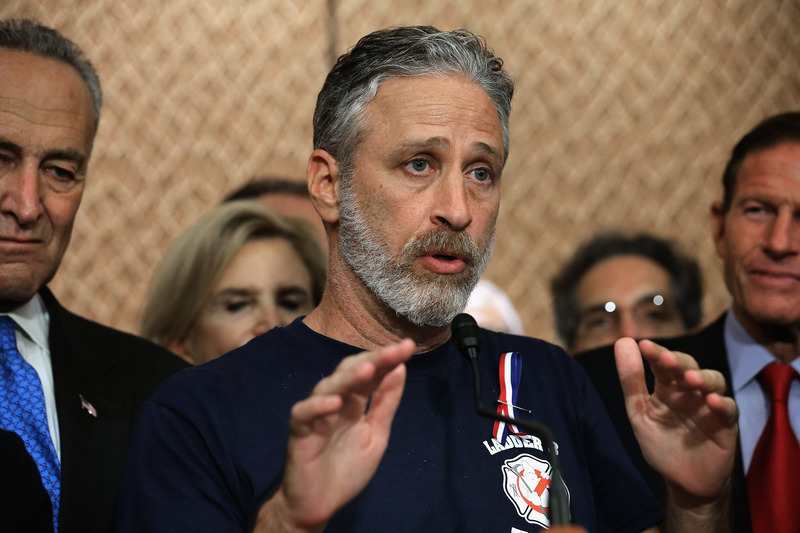 So what has Jon Stewart been up to since his tenure at The Daily Show ended? Enjoying his retirement as he sees fit would probably be the easiest way to put it. Stewart always rode a narrow line between comedy, commentary, and even a little activism, although the latter was a role he never seemed entirely comfortable embracing. Since getting out of the host's chair, however, he's made some headlines by returning to one of the most overt on-air advocacies he ever engaged in, arguing for an extension to 9/11 first responder and survivor benefits. Back in 2010, Stewart hosted a panel of ailing emergency workers who'd been afflicted by their work at Ground Zero in the hours and days after the twin towers collapsed. It was clearly a cause that affected him a great deal, so it should come as no surprise that he's continued to fight that fight now that he's living a more private life. He made an appearance at a September rally in Washington D.C., as detailed by Time. I’m embarrassed for our country. I’m embarrassed for New York, I’m embarrassed that you, after serving so selflessly, with such heroism, have to come down here and convince people to do what’s right for the illnesses and difficulties that you suffered because of your heroism, and because of your selflessness. Stewart's post-Daily Show doings haven't all been quite so serious, however. In addition to his advocacy on behalf of 9/11 responders, he's also made some headlines in recent months in a pair of new roles in the entertainment world. He is serving as an executive producer on his friend Steven Colbert's new gig, The Late Show. He even appeared in the show's opening sketch as a baseball umpire. And in what's surely one of the least-expected career developments in recent memory, he appeared at the WWE event Summerslam in August, turning the course of a match by striking well-loved wrestler John Cena with a folding chair. He later returned to the wrestling ring to explain himself, which mainly served as a means for Cena to get his public revenge, slamming Stewart to the ground. All in all, it seems like he's been enjoying the latitude that being free from The Daily Show has given him, even if it's still a sore spot for so many of his fans. Actually, maybe "sore spot" isn't quite the right way to put it — it's more like an unscratchable itch. But at the very least, it's nice knowing that Stewart is enjoying himself, isn't it?